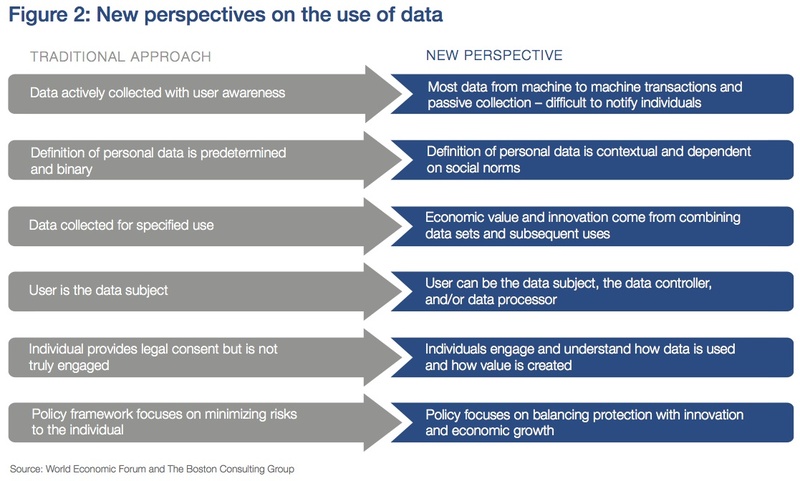 The World Economic Forum released its third major report about Rethinking Personal Data: Unlocking the Value of Personal Data: From Collection to Usage. PDEC has worked with the WEF's Rethinking Personal Data project since before its first gathering in the Summer of 2010. It is really gratifying to see this third report come out and continue to move the issue forward. The Rethinking Personal Data work is now within a larger umbrella WEF's calling "Hyperconnectivity," lead by Bill Hoffman, the original steward of the Rethinking Personal Data project. New ways to engage the individual, help them understand and provide them with the tools to make real choices based on clear value exchange. Needing to demonstrate how a usage, contextual model can work in specific real world application. The report says we must solve simplicity and elegance of design for usability so people can see the data generated by and about them. The last part of the executive summary calls for "stakeholders to more effectively understand the dynamics of how the personal data ecosystem operates. A better coordinated way to share learning, shorten feedback loops and improve evidence-based policy-making must be established." The Rethinking Personal Data project convened six face-to-face events leading to the report. I participated in four of them in 2012 on behalf of PDEC: March in San Jose, June in London, September in Tianjin, and October in Brussels. One of the meetings' themes was the challenge to rise to the Fair Information Practice Principles. The US FTC's FIPPs were written in the 1970's when citizens raised concerns to Congress about how they were ending up on catalogue mailing lists. This offline model is not an ideal basis for how to address the economic opportunities of personal data and the challenges it presents today. The second chapter covers the context of data use, where everything surrounding data use affects people's privacy expectations and the choices of institutions using their data. It's great seeing this level of nuance brought to a general business audience. 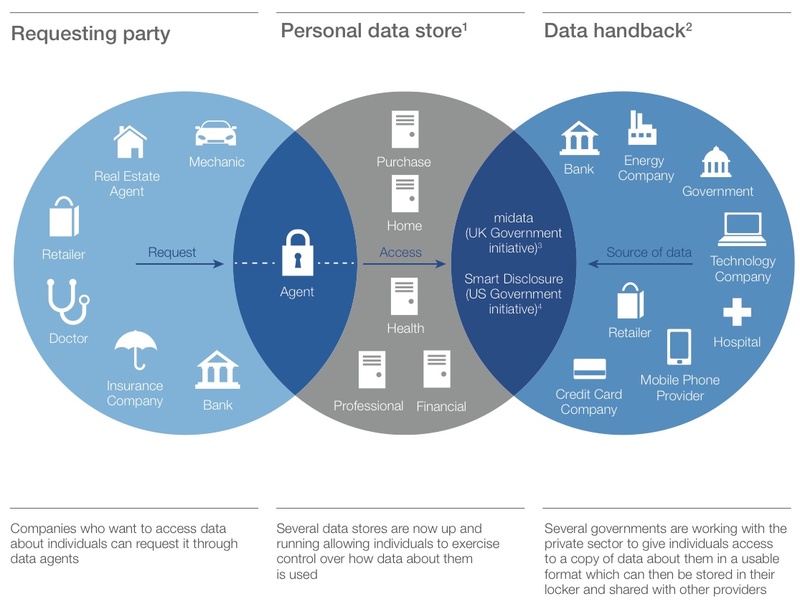 This report is notable for highlighting the role of the personal data store in initatives put forward by the UK, French and US governments that mandate Data Handbacks, that data created by an individual when transacting with a government or business should be given back to the individual. A few paragraphs stand out for me in looking ahead and the opportunity for PDEC companies. Potentially, markets can encourage a “race to the top” in which user control and understanding of how data is used and leveraged become competitive differentiators. Various trust marks and independent scoring systems will help stimulate this kind of response. Given the complexity of choices, there is also potential for the development of “agency type” services to be offered to help individuals. In such a scenario, parties would assist others (often for a commission or other fee) in a variety of complex settings. Financial advisers, real estate agents, bankers, insurance brokers and other similar “agency” roles are familiar examples of situations when one party exercises choice and control for another party via intermediary arrangements. Just as individuals have banks and financial advisers to leverage their financial assets and take care of their interests for them, the same type of “on behalf of” services are already starting to be offered with respect to data. The last section of the report outlines thirteen different use-cases for personal data by a range of stakeholders, including two PDEC startup circle companies - Personal and Reputation.com.